HOLLIS – The 10 weeks of summer vacation seemed “incredibly boring” without students in the halls at Hollis Brookline Middle School, Principal Robert Thompson said. Wednesday marked the first day for all new students to SAU 41 and those who were entering a new school, such as the rising seventh-graders going to the middle school and the ninth-graders entering high school. 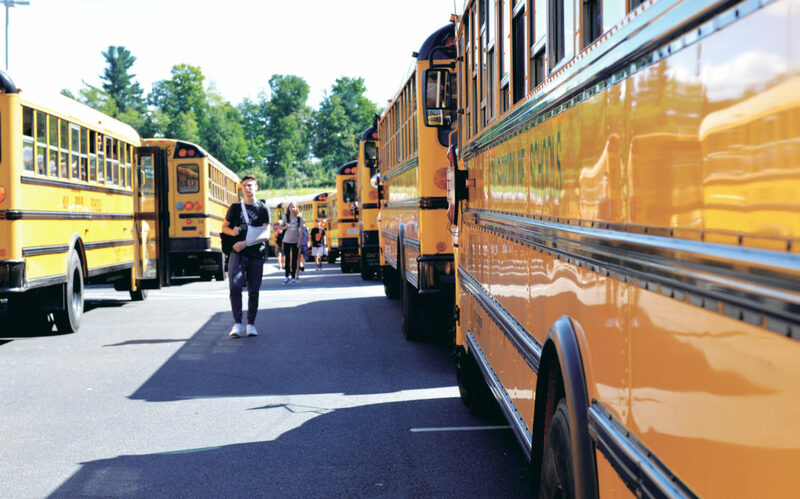 Thursday, everyone was back, and according to Superintendent Andrew Corey, it was a “very good, strong first day” across the board. This year, Corey said, the district will work to increase science, technology, engineering and math (STEM) opportunities for students, enhance its service delivery model and continue to work on its school safety protocol. In June, Hollis Brookline Middle School was awarded the 2018 School Emergency Preparedness Award by the New Hampshire Department of Safety Department of Homeland Security and Emergency Management. They will continue upgrades in the other schools, Corey said. Additionally, renovations were recently finished at Hollis Primary School and the district will work to provide other tech updates and access points this year. Thompson added that for his school, the advisory program will get a facelift and they will make some “enhancements” to promote social emotional learning among students. While there has been a great deal of talk lately about starting school after Labor Day, largely thanks to Gov. Chris Sununu’s commission to study the merits of mandating a post-Labor Day start, Corey and Thompson agreed they prefer easing into the school year. “I like having the two days prior to Labor Day to get some of the ‘business’ out of the way,” Thompson said. For school districts across the country, the first day often includes handing out books and syllabi, going over expectations, meeting teachers, etc.